LPHS held the first annual Engagement Event in the brand new Performing Arts Center on Wednesday, November 28. This was an opportunity for local, small businesses and people in community to learn about the new Indiana Graduation Pathways and how they can get involved within LaPorte Community Schools. Blair Milo, former LaPorte mayor and current, Ben Carter, had a chance to speak. “[Blair Milo] is deeply involved in developing solutions to meet the demand and challenges of employment in the 21st century in our state. Ben Carter works for the Department of Education and is leading the roll out of the new Indiana Graduation Pathways. I want our business leaders to learn from the people that are directly involved in the work of business and community engagement,” Matthew Presley, College and Career coordinator, said. 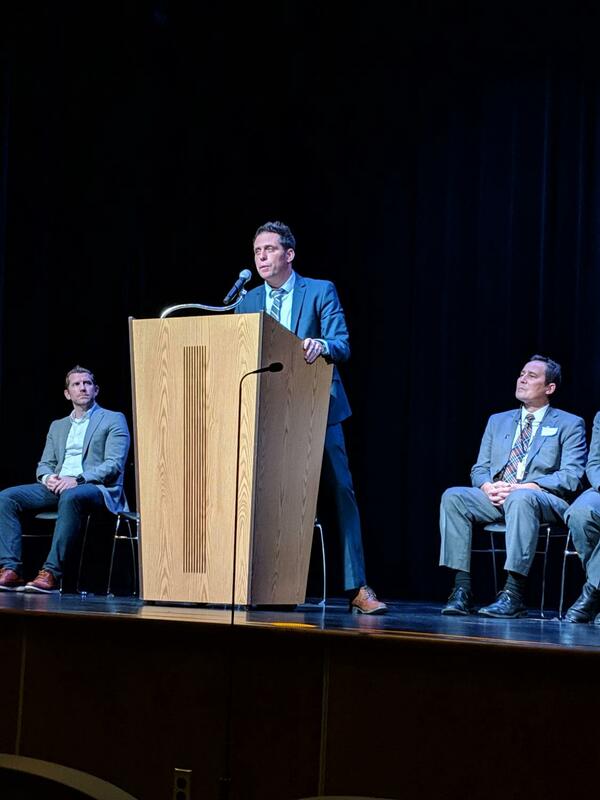 This event directly reflected how hard LPHS is working to support the students and make sure they are provided with all the resources they need to be successful after high school. Getting businesses involved within the school is essential to the future of adolescents. Providing job opportunities, internships, and possible employment are just some of the opportunities this partnership can provide. “Through these experiences, our students can learn and demonstrate employability skills and gain a real world understanding of their career interests. Business and community partners can also provide essential funding and resources that directly support student programs and school initiatives,” Presley said. Additionally, business and community organizations can directly support career education, exploration, and engagement for all of the students K-12 through providing service projects and volunteering in many different capacities to educate and prepare students. LPHS will continue to strive and work to work with businesses in the community to bring more opportunities through Hire-A-Slicer and continuing to search for partnerships that don’t only benefit the students, but local businesses as well. With the idea of this event in the works as of last year, LPHS wanted to bring business partners together to first thank them for they work that they are doing and share out opportunities for continued engagement. In case anyone missed the presentation, it can be found on the corporation website or the livestream on the Slicer Network youtube channel.